A campaign being spearheaded by an Edinburgh Napier lecturer will see free toiletries made available to those who need them most across the Lothian region. 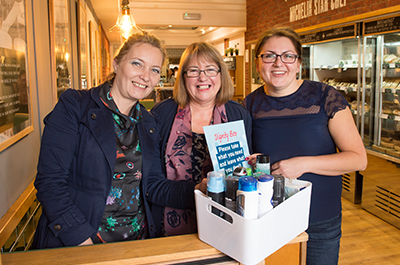 The initiative called ‘Dignity Boxes’ is the brainchild of Isabel Dosser, a lecturer in palliative care within the University’s School of Health and Social Care. The boxes will be placed in specific areas throughout the region and will offer a range of toiletries including shampoo, conditioner, deodorant, soap and shower gel to those in need. The first box has been made available at leading homeless charity Social Bite’s Shandwick Place shop. Present every second Tuesday during its Social Suppers initiative – which supplies hot food and meals to the homeless – attendees will be able to take what they cannot afford by getting access to the products in the Dignity Box, without having to ask or thank anyone. Further boxes have been earmarked for a number of locations across the region in the coming weeks, including a student box at Edinburgh Napier, the Street Soccer project based in Portobello, The Willow project on Lauriston Place as well as Daisy drop-in, and the Dale in West Lothian. For Isabel, the campaign is a chance to give something back to those less fortunate than herself. She said: “The idea really stems from my time at a nursing conference last year. Working in nursing all my life, I’ve always been aware of the benefits and welfare available to people but after attending workshops in poverty at the conference, I soon began to think about ways I could help others. 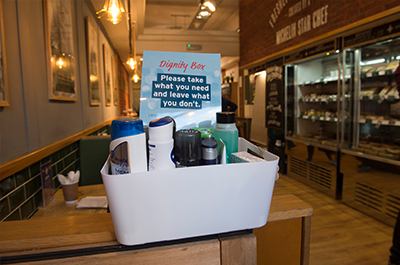 “After learning about a voluntary service (COPE) in Glasgow that provides advice and free sanitary products, I came up with the idea of the Dignity Box – a selection of free basic toiletries that will be placed in areas across Lothian experiencing deprivation. “I’m a firm believer that little things make a big difference. The aim of the Dignity Box is to promote in a small way, self-worth and dignity by allowing those in need to take what they cannot afford or get access to without having to ask or thank anyone. Barbara Haig, senior social impact team at Social Bite, said: “We were delighted Isabel would consider Social Bite for this initiative. This contribution helps our rough sleeping and homeless group who might not otherwise be in a position to purchase these essential items. Isabel also dedicated her time proactively to volunteer which was a very kind gesture. Companies and local businesses can also request their own donation box for use or discuss sponsoring a box in one area for a specific period. 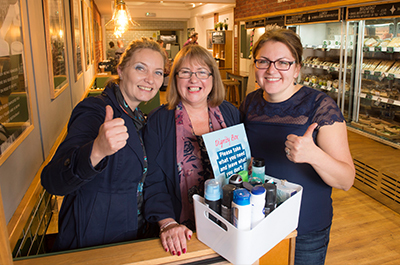 Personal Design Studio – a hairdresser in Mid Calder - is among the first businesses to pledge support in taking its own donation box for the campaign.